Why sponsor Social Media Marketing World? Thinking about sponsoring Social Media Marketing World? #1: Increase brand awareness: Your brand is front and center among thousands of social media and business marketers who are seeking to take their marketing to the next level. “Stop thinking about it and sign up for Social Media Marketing World. The team here has been incredibly supportive. Everything from the event logistics to the type of audience that’s been brought together, it’s all first class. I’m looking forward to seeing you at the next Social Media Marketing World,” David Lee, Shakr. #2: Generate better leads: Imagine your ideal prospects, all in one location. No calling, no emailing, you simply smile at the line of people who want to talk to you. “We keep coming back every year because we get lots of leads, obviously, as well as new subscribers that sign up on the spot at our booth,” Cyndi Knapic, Animoto. #3: Develop stronger influencer relationships: You’ll connect with high profile influencers who can accelerate your awareness in the industry. “A great place to be, a great place to build relationships with our target audience, but also influencers that are kind of like gatekeepers. Everything we could dream of,” Mike Sadowski, Brand24. #4: Meet your customers in person: Imagine meeting your best customers, face-to-face. “When it comes to connecting with our buyers and the people that are making decisions, Social Media Marketing World is the place to be,” Bradley Yeater, GaggleAmp. WHAT will Social Media Marketing World do for you? Attendees come to Social Media Marketing World looking for solutions. With your sponsorship, your investment puts you top of mind with the world’s leading social marketers. #1: Networking Plaza designed for maximum visibility and traffic: Sponsors are highly visible and located in the center of the Networking Plaza with ample space between booths. We’ve designed multiple reasons to be in the Networking Plaza throughout the day: only entrance and exit to keynotes, three stages with content, networking table talks, food, and beverages, etc. “It was absolutely astounding to be flooded by that number of people. We’ve been inundated. We haven’t had a quiet moment,” Rob Wilson, VidIQ. “We had a great return on our sponsorship and we met a lot of our target audience that we were able to connect with and eventually turn into business,” Bradley Yeater, GaggleAmp. Conference guide ads and listings: Promote your company in the conference guide that every attendee carries at all times and many store as keepsakes. 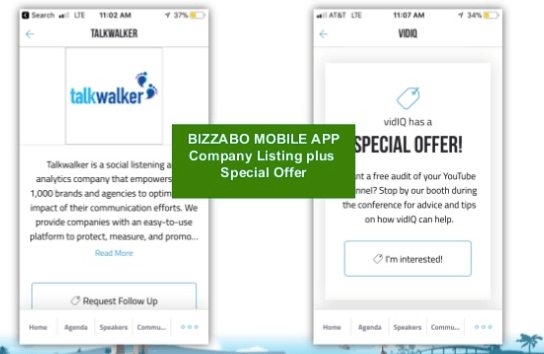 Mobile App Listing: Place your special offer in the mobile app and engage with attendees. Booth Traffic Driver: Game designed to encourage attendees to stop by your booth for your special offer and view your demo. 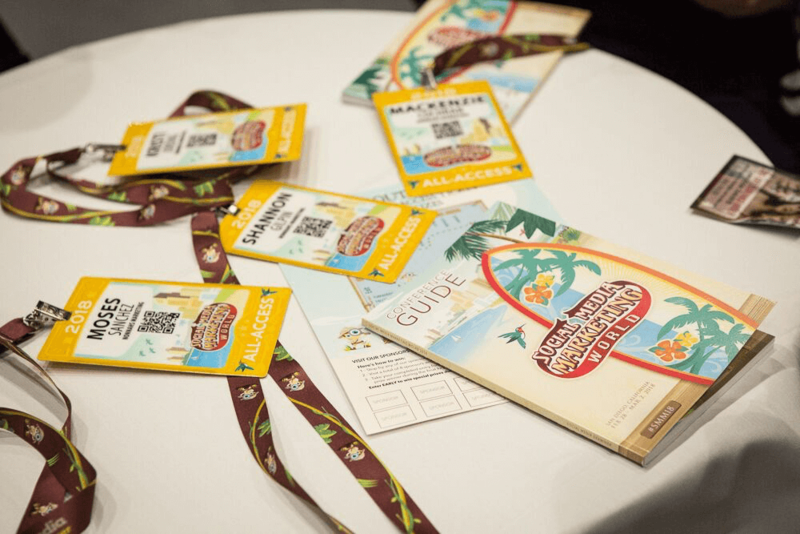 Recognition from the keynote stage: Your brand is recognized prior to each keynote and we will mention optional giveaways to drive people to your booth. Exposure at the opening night networking party: Imagine thousands of attendees talking to you as part of our Networking Bingo promotion. *Ask about our unique party sponsorship options. Attendee email promotion: Drive people to your booth with a mention in one of our daily broadcasts to all attendees. If your goal is to directly reach social media and business marketers, you’ll find the most qualified audience at Social Media Marketing World. Attendees are Social Media Examiner fans: Social Media Examiner attracts the industry’s largest and most loyal fans via its very large blog (1.3 million people a month) and podcast (300,000 monthly downloads). Quality speakers draw quality attendees: All speakers are carefully recruited based on their expertise and ability to teach. Often called the “Super Bowl” of social media conferences, we draw the largest quantity of deep domain experts. “If you’re a social media tool or you want to teach people about your tool, this is the perfect place to be.” Becky Shindell, SEMRush. How do we help you get leads? People gather to eat meals and snacks throughout the day. Attendees record podcasts and videos and take lots of photos. People gather around themed tables for planned discussions, impromptu meetups and to close business deals. Live Stage broadcasts to 500,000 plus Facebook fans. NEW: Two content stages designed to give attendees a sample of the quality content available to All-Access ticket holders. With your booth sponsorship, you are in the midst of all the action. This means more demos, more dialogue, and more leads. “A perfect place to demo, this is the perfect target audience for us,” Glen Aspeslagh, Ecamm. #2: Effortlessly collect leads: With a simple mobile app on your phone, you can scan the badge of any attendee and acquire their contact information. This means you can focus more on showing off your product. “Not only are we achieving our business goals at Social Media Marketing World, we are smashing expectations,” Andrew Kan, TubeBuddy. 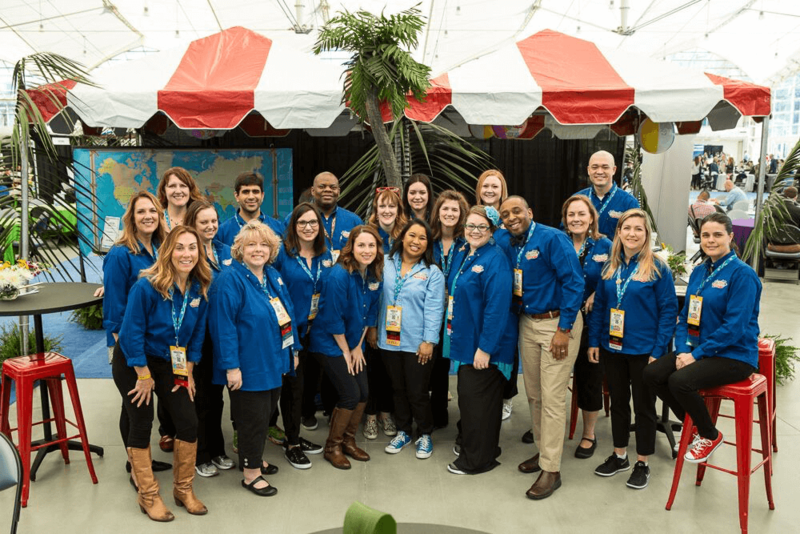 #3: Locate key prospects via our Networking Ambassadors: The pros at our Networking Embassy can help facilitate connections with specific attendees, helping you make that important contact. #4: Pre- and post-event prospecting: Build relationships with Social Media Marketing World attendees months before the conference in our private networking group. Getting discovered by the right influencer can be an accelerant that fuels your business growth. Among our world-class speakers and attendees, you’ll find influencers in every major industry and on every major social platform. “If you’re in the social media field, you owe it to yourself to come here at least once. This is the World Series. The World Cup of social media marketing.” Mark Schaefer, globally-recognized author, speaker, podcaster and business consultant. Need to connect with top Facebook experts? Check. Looking for top Instagram experts? Check. Hoping to learn more about Messenger and Chatbots from experts? Check. “If you’re looking for new, hot ideas on how to build your audience on social media, understand these new platforms, really leverage it the right way, then come here,” Lewis Howes, author, podcaster, and former pro athlete. Developing stronger relationships with influencers will never be easier. #1: Speakers are highly accessible: We don’t have a speaker ready room that speakers can retreat to–by design. This means all speakers network in the same places as attendees. “Loved that the speakers weren’t hiding between sessions, instead they were networking and engaging with everyone,” Brian Fanzo, digital catalyst and expert on how to reach millennial and Gen Z consumers. #2: People gather at tables around interest topics: Dozens of tables are labeled with special discussion topics to help bring people together based on shared interests. Examples include social selling, management tools, video marketing, Facebook ads, analytics, virtual reality, social customer service and many more. “There’s really no other conference that you can get this depth of connections and knowledge.” Mari Smith, Leading Facebook marketing expert, author and Facebook Partner. WHERE does Social Media Marketing World take place? 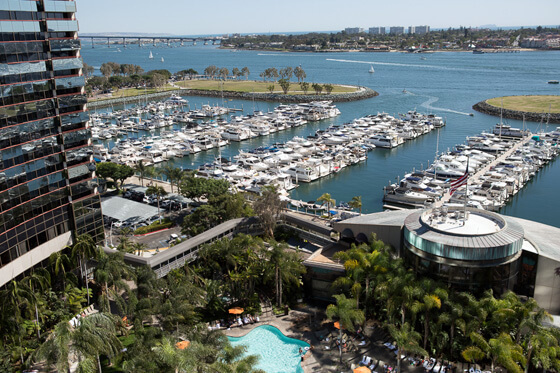 Social Media Marketing World takes place in “America’s Finest City,” San Diego, California. “If you’re thinking about becoming a sponsor, highly, highly recommend it. Great atmosphere, great people, great location, beautiful weather, awesome parties,” Rudy Ellis, Switchboard Live. A beautiful city AND an amazing venue. Social Media Marketing World is held at the waterfront San Diego Convention Center–home of Comic-Con International. With 70 miles of pristine beaches, a dazzling array of world-class family attractions and its idyllic climate, San Diego is a truly remarkable experience for everyone. Local activities include surfing, whale watching, SeaWorld, LEGOLAND, San Diego Safari Park, San Diego Zoo, and more! Extended vacation anyone? Watch this video to learn more about what to do in San Diego. San Diego enjoys beautiful weather year-round with an average daily temperature of 70.5° F (21.4° C). “We love this conference and this is the absolute perfect place for us to be,” Tamar Garfunkel, Promo. 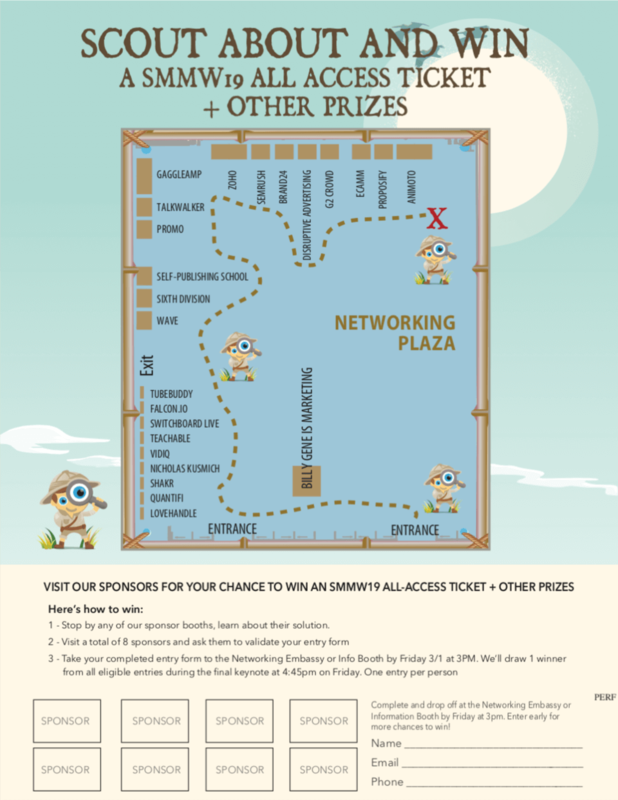 WHO attends and sponsors Social Media Marketing World? Imagine making connections with the world’s top social media pros including Mari Smith, Jay Baer, Ann Handley, Michael Stelzner, Michael Hyatt, Amy Porterfield, Chris Brogan, Mark Schaefer, Kim Garst, Tim Schmoyer, Darren Rowse, Gini Dietrich, Shaun McBride, Joel Comm, Viveka von Rosen, Zach King, Marcus Sheridan, Amy Schmittauer, Pat Flynn, Joe Pulizzi, Cliff Ravenscraft, Chris Penn and many, many more. Looking for big brands? Many of the world’s most recognized brands attend, including Amazon, BMW, Deloitte, Experian, Ford, Hilton, Hyundai, International Monetary Fund (IMF), IBM, IKEA, Intel, Kellogg’s, Loan Depot, Marriott, Novartis, P&G, Robert Half, Sprint, Sam’s Club/Walmart, Synchrony Bank, UPS, United Health, Verizon, and many more. Plus, you’ll network with people from Facebook, Google, LinkedIn, Pinterest, Twitter, YouTube, and other platforms. Some of our sponsors have included Billy Gene is Marketing, Animoto, G2Crowd, Brand24, Disruptive Advertising, LoveHandle, Zoho, Ecamm, Promo, TubeBuddy, Proposify, Techsmith, Wirecast, Quantifi, GaggleAmp, Teachable, Shakr, SEMRush, Nicholas Kusmich, SixthDivision, Falcon.IO, Switchboard, VidIQ, Self-Publishing School, Build-A-Head, HeyOrca, HubSpot, Guru.Club, StickerYou, Website.WS, Simply Measured, Hootsuite, Adobe, Cision, Animoto, Brandwatch, Talkwalker, Animatron, Dynamic Signal, Cox Business, Pinterest, LinkedIn, LiftMetrix, Synthesio, Union Metrics, AgoraPulse, TapInfluence, Nexgate, Digimind, Trackmaven, Shareasale, Siteground and Newscred. To add YOUR company to our exclusive sponsor list, contact Emily Crume, Director of Strategy at 949-444-8459 or emily@socialmediaexaminer.com.